It didn’t take long for the UFC Fight Night 95 preliminary card to deliver earlier tonight (Sat., Sept. 24, 2016) from Ginasio Nilson Nelson arena in Brasilia, Brazil, as former TUF standouts Vicente Luque and Hector Urbina unloaded in a quick welterweight scarp. Let’s just say Luque didn’t disappoint the home crowd. 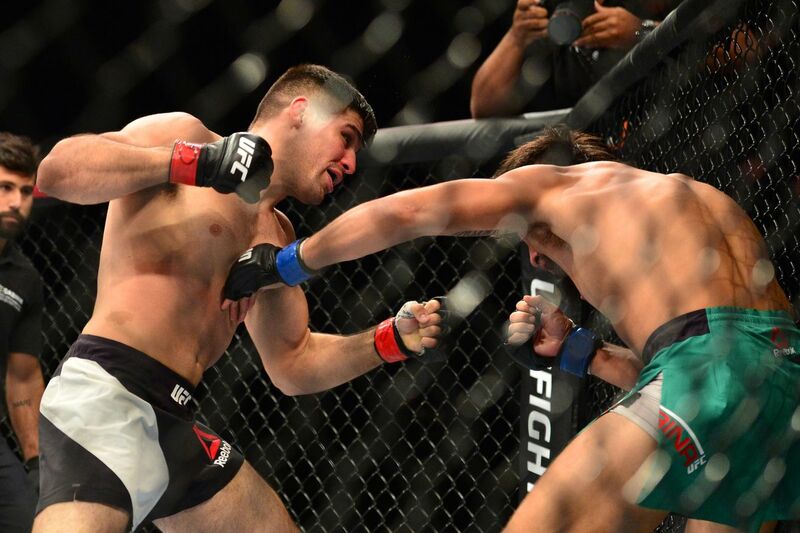 After a few brief exchanges and heavy leather thrown by Urbina, Luque uncorked a beautiful combination that sent the 29-year-old back into the cage. From there, Luque landed a powerful overhand right that dropped Urbina and put him to sleep with just one minute off the clock, earning the vicious first-round knockout finish. With this win, Luque continues to prove he’s evolving at just 24 years of age. The submission specialist has once again shown glimpses of being a knockout artist on the feet and will look to climb the 170-pound ranks in 2017.